Go ahead... pull his finger. If you love Farting Guy visit www.fartingguy.com to see Farting Cat, Farting Pig, Farting Deadly Snake, Farting Frog and more! Get the code and put these characters on your own site or MySpace page. The minister at this church must be really liberal - hee hee, wink wink. 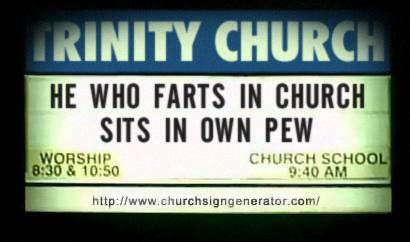 Enjoy our funny church sign picture of the day. And be sure to check out our other favorite funny sign. You'll get a kick out of that one too! Fart clock from PrankPlace is an absolute scream. Farting wall clock farts on the hour to the tune of a different fart. From the Prank Place web site: "Farts every hour on the hour! 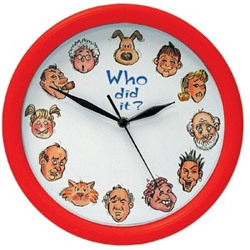 Every hour the Fart Clock lets out one of many different farts from one of a dozen shame-faced characters. Our entertaining 12" timepiece will look great (and sound even better!) in your den, garage or workshop. Includes light sensor to turn off the sound when the room darkens." Animated gifs of fart smileys. And there are people that think we have way too much time on our hands. We've got a bunch more of these little farting animated smilies in our .gif pictures collection that we'll share so keep your eyes peeled for more smiley fun! Fart video of animated cartoon bunny and witch. Witch turns rabbit into a pig and the farting fun continues. Found this little fart gem on Yahoo videos. We haven't seen this one around before so we know you're sure to enjoy this funny farting video animation cartoon: "Kumita". Press play button to begin. Fart Alert Button Whenever someone lets a ripe one rip, just press this big red button and humiliate them. It's great for your cubicle or home office. Keep it handy because you never know when someonewill pass by...and pass gas! 5-4-3-2 - FART! - Oops! FART! Ooops..that one kinda slipped out! Price is only $9.89 and can be purchased at PrankPlace. 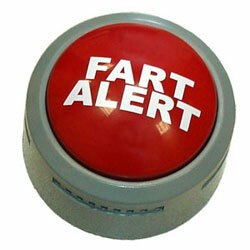 Click on the Fart Button above or follow any highlighted link to get yours now!